Richard Martel and his research team at the Department of Chemistry of the Université de Montréal have discovered a method to improve detection of the infinitely small. Their discovery is presented in the November 24 online edition of the journal Nature Photonics. "Raman scattering provides information on the ways molecules vibrate, which is equivalent to taking their fingerprint. It's a bit like a bar code," said the internationally renowned professor. "Raman signals are specific for each molecule and thus useful in identifying these molecules." Applications of the discovery: retail, banks, hospitals, etc. 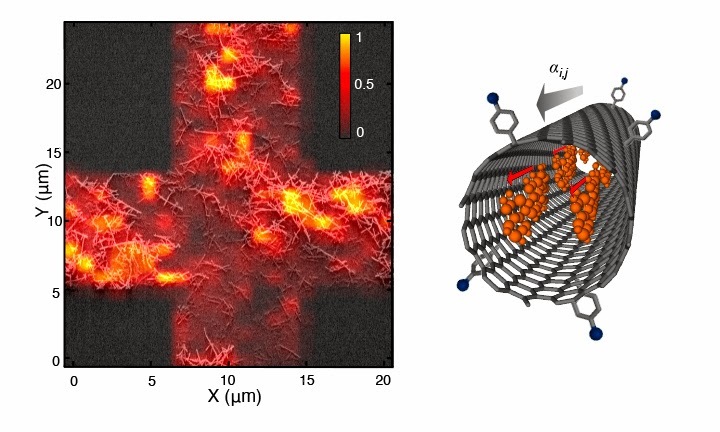 The discovery by Martel's team is that Raman scattering of dye-nanotube particles is so large that a single particle of this type can be located and identified. All one needs is an optical scanner capable of detecting this particle, much like a fingerprint. "By incorporating these nanoparticles in an object, you can make it perfectly traceable," he said. Due to their unique structure, carbon nanotubes, which are electrically conductive, can be used as containers for various molecules. Coupled with a dye, these nanoprobes can increase the complexity and strength of the received signal. Nanoprobes, which are composed of around one hundred dye molecules aligned inside a cylinder, are 50,000 times smaller than a human hair. They are about one nanometre (nm) in diameter and 500 nm long, yet they send a Raman signal one million times stronger than the other molecules in the surrounding. According to Professor Martel, the applications from this discovery are numerous. In medicine, nanoprobes could lead to improved diagnostics and better treatment by adhering to the surface of diseased cells. These specifically modified nanoprobes could, in effect, be grafted to bacteria or even proteins, allowing them to be easily identified. One could also imagine custom officers scanning our passports with Raman multispectral mode (i.e., involving several signals). Nanoprobes could also be used in banknote ink, making counterfeiting virtually impossible. The beauty of it, said Martel, is that the phenomenon is generalized, and many types of dyes can be used to make nanoprobes or tags, whose "bar codes" are all different. "So far, more than 10 different tags have been made, and it seems the sky's the limit," he said. "We could, in theory, create as many of these tags as there are bacteria and use this principle to identify them with a microscope operating in Raman mode." Raman scattering mode is an optical phenomenon discovered in 1928 by the physicist Chandrasekhara Venkata Raman. The effect involves the inelastic scattering of photons, i.e. the physical phenomenon by which a medium can modify the frequency of the light impinging on it. The difference corresponds to an exchange of energy (wavelength) between the light beam and the medium. In this way, scattered light does not have the same wavelength as incidental light. The technique has become widely used since the advent of the laser in the industry and for research . But until now, molecular Raman signals have been too weak to serve the needs of optical imaging effectively. So researchers have used other more sensitive techniques but which are less specific because they have no "bar code." "It is technically possible, however, to enhance the Raman signals of molecules using rough metallic surfaces," said Martel. "But their sizes limit the applications of Raman spectroscopy and imaging." By aligning dye molecules encapsulated in carbon nanotubes, the researchers were able to amplify the Raman signals of these molecules, which until now have not been strong enough to detect. The article presents experimental evidence of extraordinary scattering of visible light on a nanoparticle.